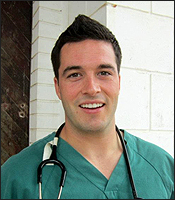 Jared graduated from St. George’s University of Veterinary Medicine in 2013. He lived 3 years in St. George’s Grenada and finished his studies at Cornell University, Ithaca, New York. After graduation he started work at an Emergency Veterinary Clinic for a year and enjoyed every aspect that emergency medicine has to offer. Jared followed by his family had decided to purchase Granada Veterinary Clinic in April 2014. Jared has a unique family as his father, brother, sister-in-law are all Veterinarians. Occasionally they all make an appearance here at Granada and all strive to provide quality compassionate family care medicine. When Jared is not busy at work he spends much of his time with his wife Angela (who is also a Veterinarian), his dog Zuke (who is a Border Collie) and cat Basil. Typically during the summer he is lounging at the lake. Erin graduated from the Western College of Veterinary Medicine in 2016. She spent the last two years working in rural mixed animal practice seeing everything from rabbits to horses. 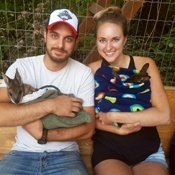 While she enjoyed the variety, Erin is excited to focus on your pets, including pocket pets and exotics. 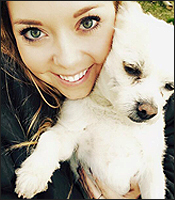 In her free time, she loves to travel, dance and take her Jack Russel X, Ozzie, for a walk. She also has a guinea pig named Boo who keeps her busy. Dr. Ken graduated from the Western College of Veterinary Medicine in 1984. After graduation, ken worked in Spruce Grove for 2 years before acquiring the Vegreville Veterinary Clinic in 1986. In 2014 Ken along with his two sons Jared and Josh, purchased Granada Veterinary Clinic. Ken and his wife Deb also have a daughter, Kara. When Ken is not caring for animals, he spends much of his time at the lake with is grandchildren and his two little dogs, Coco and Tucker. Amanda is a new graduate from NAIT’s Animal Health Technologist program. 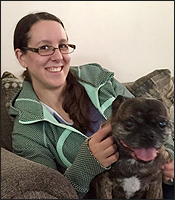 She is very excited to start her career at Granada Veterinary Clinic and has been a huge asset to our team. Amanda has a dog named Lucy (a Weastie) and a lovebird named Penny, both of which Amanda couldn’t imagine life without. In her free time she enjoys travelling, going to the gym and spending time with family and friends. She is very eager to start her new career. Alison has been working at Granada Veterinary Clinic since 2012 as a Veterinary Medical Receptionist. She graduate from Sheridan College from Animal Care in 2005. She was born in Toronto, ON but decided to move to Edmonton due to our nice weather . Alison has two cats, Bob and Lulu and she indicates that she would be a crazy cat lady if it wasn’t for her husband. Outside of work she enjoys running, traveling and watching movies. Alison is excited to see growth within the practice and we are very excited to have her on board. Jenn joined Granada Veterinary Clinic team in 2017. 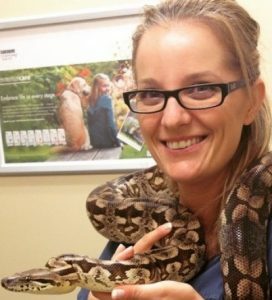 Her love of animals and working with the public has kept her in the veterinary industry since 2004. Jenn has a soft spot for senior cats. She currently has an empty house, but we’re sure that won’t last long. In her spare time, Jenn enjoys cooking, watching baseball and, of course, anything cat related. Sharon graduated from Lakeland College Animal Health Technologist program in 2004. 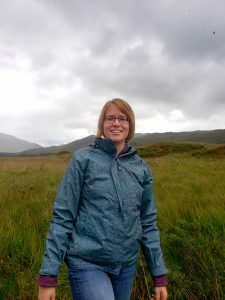 Since graduating she has worked in both small and mixed animal practices. She recently moved to the Sherwood Park region and since her move she has joined our team at Granada Veterinary Clinic and we couldn’t be more than happy to have her. 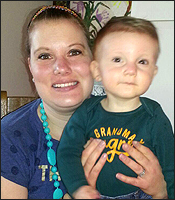 Sharon enjoys camping, curling, traveling and spending time with family/friends and her recent newborn, Colten. Sharon is very excited to working with the furry family members of Granada Veterinary Clinic. Stefanie joined the Granada Vet team in August and is becoming a valued member of our team. 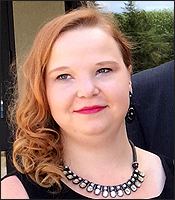 She graduated from GPRC Fairview Campus in 2015 with a Diploma from the Animal Health Technology program. She recently moved to Edmonton from Calgary with her husband Sheldon, and 2 cats, Spooky and Sasquatch. In her free time Stefanie enjoys kayaking, hiking, horseback riding and DIY projects around their new house. 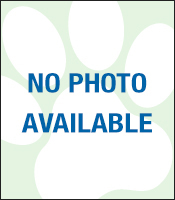 Becky has been a Technician assistant at Granada Veterinary Clinic since 2010. She has a strong passion for her work and enjoys every aspect of working in a veterinary clinic. Becky has two dogs named Dallas (a Dachshund) and Teakie (a Chihuahua). Growing up she has had several dogs and cats, and occasionally fish. Living with several animals she developed a strong passion for working with them. During her free time she enjoys listening to music, drawing and spending quality time with her family. She has two brothers who play at a high level of hockey so she spends quite a bit of time at the hockey arena.